The sunflowers are in bloom as the temperatures stay high, and I’m knitting away on a wool sweater for my Junebug. I’ve picked up the stitches along the cabled “scarf” portion of the yoke, did the arm increases and now I’m just motoring away on the body. That’s about 7.25 inches of body there, and I’m going to keep going until 9.5 inches or so, when I’ll start on 2 inches are ribbing. 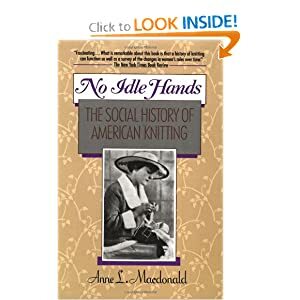 The book this week is No Idle Hands: The Social History of American Knitting, which I’ve been working on since last summer. I love this book, as it combines two of my favorite things: history and knitting. It starts off with the Colonial Era and guides you through American history via the knitting habits of the times. I’ve made my way to the beginning of the Second World War, and all this reading about women rallying their domestic skills to support the troops just invokes a strange nostalgia in me. I don’t want war–it’s the idea that a generally feminine vocation was needed during those times. (Well, not as much by WWII, but definitely during earlier wars.) Knitting has been all but relegated to the world of hobbies and amusement, and it used to hold such an important place in the daily lives of women. It’s hard to explain the pull of wearing clothes you made yourself, or eating food that you grew in your backyard, or just fixing something without having to pay a professional to fix it for you. Personal satisfaction with a job done well? Maybe Little House in the Big Woods is a dangerous book for young children to read, as it fills their heads with the idea of personal industry and self-reliance. I am so interested in that lifestyle and I totally blame Laura Ingalls Wilder for planting the idea in my heart! Reading about interesting times and knitting for a spunky little girl–there aren’t a whole lot of other ways to pass one’s time more pleasurably. This week I’ve been pre-reading At the Sign of The Sugared Plum by Mary Hooper, and I started knitting up a cabled-yoked cardigan for Junebug. However, given that it’s written for the middle-school crowd, I read it with pencil in hand to mark passages that I will omit when I read it out loud to the girls. I’m of the opinion that an eight year old and a five year old girl don’t need to hear about prostitutes, the king’s mistresses, or wallow in any romantic passages. I will leave out seven different selections throughout the book. There’s a sequel to the book, Petals in the Ashes, that deals with The Great Fire of London which happened in 1666. I’m thinking of buying it as well. The cardigan for Junebug has been long in coming. I stitched up sweaters for both Bluebird and Penguin last year, and promised Junebug that I’d make hers when I was finished with theirs. Here we are, a year later, and no sweater for Junebug. While we were out Yarn Questing a few weeks ago, I told her that she could pick out any yarn she liked best and that I would make it into a sweater for her. After many almost-choices, she chose this “Minnie Mouse yarn with rainbows in it” and has requested a cardigan with white buttons. I’m adding the cables because I need a little something in the design to keep my interest. See more books and yarn at Small Things. After days of mulling over which pattern to choose, Carly finally decided to go with the Echo Flowers Shawl. I enjoyed the moment of decision but briefly, as I was now face with a new matter to decide: Which yarn? Now, to all you non-knitters out there, your choice in yarn dramatically affects how your project will turn out. It’s more than just choosing a color, it’s also choosing what type of fiber is in your yarn. After asking Carly a few questions about how she wanted the finished product to look and feel (she wanted glossy and smooth), I made the decision to go with a blend of wool and silk–wool for warmth, silk for shine and smooth strength. I went to the internet on Monday. Zephyr is available in a lot of places in the $11-14 range, but I stumbled across a site that was offering it for only $9.25 per skein with free shipping. I was out of money until Thursday, but when Thursday rolled around and my new allotment of cash was automatically deposited into my account I fired up the ol’ computer and click, click, ordered! Woo hoo! It was going to take a week to arrive, but I figured it was worth it for the awesome price of only $18.50. As luck would have it, I fulfilled a weight loss goal that rewarded me with a trip to my favorite yarn store, Blazing Needles, up in Salt Lake City that Saturday. I oohed and aahed at all the lovely yarn offerings, and stopped in my tracks when I came face-to-face with shelves of Zephyr for $11.75 per skein. AUGH! I resisted the urge to just buy what I needed then because I had already ordered the yarn from the online store. I departed with some other yarn for a different project and a lovely book of mitten patterns. The suspense was killing me. I raided my yarn stash for some lace-weight yarn and cast on for a Percy Shawl in order to satisfy my urge to knit lace. Whenever I’d start getting worked up over how long it was taking for the Zephyr to arrive, I’d pull out my Pink Percy and start knitting. It helped immensely. That Tuesday, I received an email after the children went to bed. It informed me that the online store was out of stock of the black Zephyr and that it would take two weeks for them to receive it and then another two weeks for them to ship it to me. Yeah, count that, it would take a whole month until I’d receive my yarn. I phoned Michael and vented all my frustrations over this yarn and asked him for a logical, rational decision as how to pursue because I knew I was starting to become a little nutty over this whole yarn situation. He suggested that I call the shop, cancel the order and then phone my beloved Blazing Needles and ask if they could ship some of their Zephyr to me. So I followed his advice and happily found out that, for only $5 in shipping, Blazing Needles could indeed ship yarn to me. With tax and shipping, their yarn ended up costing around $30. Ouch. The pain was significantly lessened when the yarn arrived just two days later on Thursday. I was all smiles as I walked back to my house, and some neighbors who were taking a walk noticed my happy demeanor and asked why I was so cheerful, to which I responded with, “I’VE GOT YARN!” I don’t think they understood the significance of my declaration, due to the puzzled looks they displayed. I didn’t care; I just skipped up the sidewalk to my front door and enthusiasticaly exclaimed, “IT’S HERE!” when I walked into my house. Husband and children came running to view my glee. It was suggested that I bring the coveted skeins to Knitting Night that night, but after taking so much effort to get it into my house, I was literally afraid to take it outside of my house. So the yarn stayed home, patiently waiting for me start working with it. Stay tuned for Part Three of “The Wedding Shawl”: Knitting Chart #1. While frolicking about during Yarn Quest, I saw a Linen Stitch Scarf made from luscious Koigu Painter’s Palette Premium Merino on display at Blazing Needles. I decided that I needed; yes, NEEDED, one for myself. I bought a crazy combination of colors and cast on that very week. Six weeks later finds me with this much progress. While choosing my colors, I decided to take a risk and go for an all-out color cacophony that would scream, “Cheerful!” amidst the drab winter months. I think this scarf will do a fantastic job of executing my intent. My original goal date for completion is the end of September…we’ll see how that goes. Yeah, it’s not too terribly exciting to look at right now, but I’m very eager to see how it turns out. And yes, I know that I have the Peacock Stole I should be working on…and that my head is still bare and releasing precious heat every time I wander outside in this frigid landscape. I really should be focusing on those projects. However, I was sitting in church last week, and I started just looking around the congregation and when my gaze fell upon one of my friends I had the thought to make a hat for her. Having plans to start making a hat for myself after I finished the Bella Mittens, I shook my head and dismissed the thought–it’s not my job to furnish the world with handknit goods. However, during Relief Society that same friend said something about promptings: “Just do it, even if you have no idea why.” So I decided to make her a hat. This is the Lace Beret Pattern (#13) from Vogue Knitting’s Fall 2009 issue. I’m using KnitPick’s Bare Merino Wool Sock Yarn, from the stash, after deciding that I wasn’t going to buy any more yarn this year. I’ve never actually knit with just plain white before, and I’m really liking how it’s turning out. I am becoming envious of this beret…but I can’t pilfer two intended gifts in a row, so this will most definitely go to its intended recipient. And besides, it probably won’t even fit me anyway because I have an enormous head and I’m making this in the smaller size. Thwarting my own greediness from the start…smart move. And the Knitting Mojo Returns! Let me tell you, I have missed my quality time spent with yarn and sticks. Now that I’m over my nausea (for the most part), I can once again stand to look at a project for more than two minutes without wanting to throw up! Yay! This is mitten #1 of the pair of “Bella’s Mittens” that I started back in September. It had been left abandoned on the shelf until a few days ago. I know of a few young ladies who would probably like it very much if they became the owners of such a pair of mittens. The idea that they might be done in time for Christmas gifting has been hampered by occurences such this: This is commonly referred to as “pride goeth before the fall.” I got cocky about doing the cables and stopped looking at the directions and then did them backwards and didn’t realize it until about ten rows later. But the mistakes have been corrected and I have moved on. Oh knitting, I have missed our daily chats. Let’s not ever stray from each other ever again. The swatch blocked perfectly to the preferred 5 1/2 by 5 1/4 inches. Excellent. I’m using JaggerSpun Zephyr Wool-Silk #036 Juniper. I bumped up my needle size to US4 instead of the recommended US3 because I tend to knit tight. Also, in beginning to knit this little darling I have come face-to-face with my worst fear: What if this truly is above my skill level? My knitting skills are definitely being stretched with Lil’ Ole Mr. Peacock here. It’s 109 stitches across, NINE DIFFERENT charts to follow, 304 rows…and that’s just half of it, you get to knit the other half when you get to that point. Why keep on with the crazines and the mental exhaustion? Because it’s for my granny, whom I adore immensely and would do almost anything for. I have wanted to make something “big” for her for forever, and she has finally given me my head to do so and darn it, I’m going to do a spectacular job with it. I have created the odd knitted article here and there for her, but nothing that I would actually want her to confess to having been created by me. I made her a scarf when I was first learning to knit and I really wish I could somehow locate it and burn it–Fun Fur was involved. And then I made her a very nice Lopi Earflap hat–that was two sizes too big. This stole needs to be drop-dead gorgeous and as near perfect as possible. I did have a great idea last night that kept me from sleep for many hours: BEADS. How gorgeous would this be if I incorporated beading into it? Can I just say that I totally love this scarf? Seriously, this has been a great knit. I love cables…it’s so fun to watch them appear as you knit. I might knit another one of these. That’s saying a lot because I’ve never knitted the same thing twice. Ever. This is the scarf I’m making for my International Scarf Exchange 6 (ISE6) pal. I’m rather surprised that I ended up going with something as involved as this is going to be, given the time frame and my obvious time shortages for anything extracurricular. My pal mentioned that they liked cables and hadn’t yet tried the technique themselves…so I figured that since I like knitting cables so much, why not spread the love a little bit? Anything worth doing is worth doing well, right? This is a shot of half a repeat. I plan to do about ten repeats and am aiming for half a repeat a day. I never have time for knitting on the weekends, so I’m looking at 2.5 full repeats a week, which should take me about a month to get this done. It absolutely must be finished by May 26th, so my proposed stitching schedule will definitely keep me ahead of the game, which is good. I’m going to estimate this as being about 40% done. There’s nothing special about the patterns, just a 2×2 ribbing; but I love the yarn and just wanted to show it off in something simple. The scarf is going on hiatus for a while as I channel all available spare nano-seconds into the Aran Scarf for my ISE6 pal, so I thought I’d post a little picture…because it’s pretty.